The Management of the Federal Polytechnic, Nasarawa wishes to inform the general public that the sale of admission forms for HND, IJMB & Pre-ND (Full-Time) for the 2017/2018 academic session will commence on 19th June 2017. 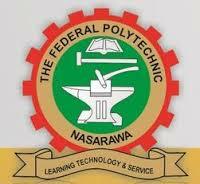 Applications are invited from suitably qualified candidates for admission into the following full-time programmes run by the Federal Polytechnic, Nasarawa for the 2017/2018 Academic Session. HND: National Diploma (ND) in the relevant fields from recognized Polytechnics with at least Lower Credit plus at least five (5) credits in GCE O’Level, SSCE or its equivalent in relevant subjects including Mathematics and English Language, and a minimum of one-year post qualification industrial attachment. The deadline for submission of applications is six (6) weeks from the date of publication [19th June, 2017].